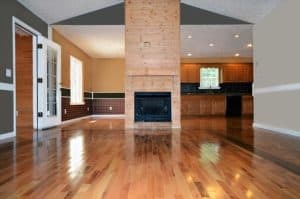 When it comes to finishing or refurbishing your floors, the quality and type of finish matter a lot.This article will help you decide on the best fit for your needs by discussing the best water-based polyurethanes for floors and why it would make sense to use them in place of oil-based ones. 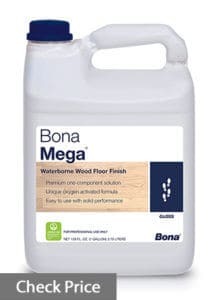 Bona Mega is a mid-grade water-based polyurethane regarded for wood floor finish. This is a perfect brand for customers who are on a low budget. Despite being midgrade, this poly gives users the intended outcome. This is an oxygen-crosslinking pole made with a well-verified formula to deliver extraordinary performance. The crosslinker used is the oxygen present in the atmosphere. The product is available in satin, gloss and semi-gloss. There are no additives to the mix. Thus, it enhances the natural wood color to show the natural beauty of the wood. Also, Bona Mega doesn’t have a limited pot life and no wasted finish too. This product has been tested and proven to perform accurately and meet the value of standards in the industry. Also, Bona Mega is approved in terms of volatile organic compounds. One gallon of this ploy covers approximately 600 sq ft. It refinishes the floor amazingly to give your floor a great look. For best results, this poly works well when applied in three coats with sand in between. At first coat, the floor is still rough but after the second and the third coat the floor looks and feel perfectly smooth. The floor gets hard and ready to use within a few days. Among the flooring brands, Bona Mega stands out as the best regarding revamping old floors. It lays out super smooth to make an 80-year old floor shine bright and feel soft as a brand new floor. The directions of using Bona Mega are easy to follow and obtain the intended results. Even on high traffic floors, this poly produces results. It is, however, advisable to apply it on a warm or humid day. While applying the poly, you should be wearing socks as shoes will leave permanent marks on the floor. The poly produces nearly zero odor, and your pets are safe around the floor even immediately after application. 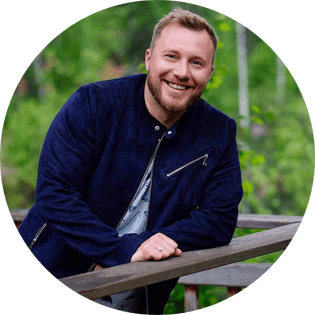 In this regard, people with breathing problems can apply the poly successfully without any difficulties throughout the process. This is a high-end poly from Bona. It is highly regarded for its ability to meet the various demands regarding performance and appearance of floors. 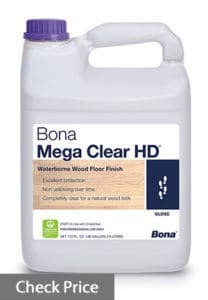 Bona Mega clear HD is available in satin. This poly is of incredible value as it is made from a tested and verified formula to give the clients great waterborne poly. This poly is made of chemical resistant products which increase scratch resistance. It does not have amber tint and thus, doesn’t produce a yellow coloring on your floor after some time. The poly is virtually odorless and non-flammable. 1 gallon of the poly covers an area of up to 600 sq ft. As noted in the label, this coating should not be applied in extremely low or high temperature or rooms with high humidity. Just like other Bona products, Bona Mega HD has an unlimited pot life and does not have a wasted finish. It has an exceptional build and clarity to enhance the appearance of your floor in an incredible way. During application, the flow and leveling characteristics of this poly are excellent. It dries fast in approximately two or three hours at most. It takes a maximum of one week to cure completely. Minwax Polyurethane is a protective that is crystal clear, ultra-fast drying protective top coat for interior wood. It is recommended for use on interior wood surfaces such as doors, paneling, trim, cabinets, furniture and sure floors. This coating cleans up easily with warm water and soap. This coating is fit for use on bare wood in both oil-based and waterborne stains. It can be recoated in as little time as two hours as it has little volatile organic compounds. Compared to traditional solvents based polyurethanes, this Minwax product has a low odor, dries fast, and is crystal clear. Besides, protecting the natural beauty of the wood surface, it adds on to the beauty of the wood. 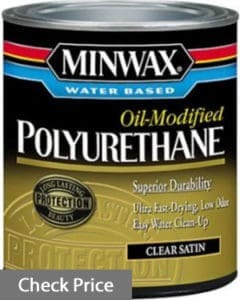 Minwax Polyurethane is available in gloss, semi-gloss, and satin sheens. All these finishes provide a durable cover with a more luxurious look for the wood. This poly works best if applied in three coats. The best application tools to ensure the right results include; foam brush, synthetic bristle brush, or a lambswool applicator. The surface of the application should be dry and free from any foreign materials. Sanding the surface is recommended to obtain a uniformly smooth surface. After sanding, clean the surface and wait for it to dry. Then, apply the poly while following the instructions and guidelines. Applying the oil-modified polyurethane is easy. One should continuously stir before use and while in use to avoid some content settling on the bottom. Then, apply a thin coat of the oil-modified poly with a T-bar coater and leave it for two hours to dry thoroughly then apply a second coat and a third coat two hours after the second. The project should be left for 24 hours before light usage. While coating a hardwood floor, it is recommended to a synthetic pad for application to avoid leaving marks on the floor. To get full durability of the coating, it is recommended to avoid heavy traffic on the floor within 72 hours of application. 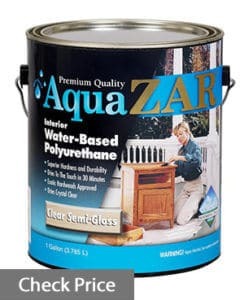 Just as the name suggests, Aqua Zar is a water-borne polyurethane. It is highly regarded for its beauty, non-yellowing and durability characters. Among the water-based polyurethanes, Aqua Zar stands out with durabilities like oil-borne durability and eco-friendliness of waterborne polys and a crystal clear finish. It is the perfect poly for light colored stains. The poly dries fast, has a low odor and is made with a verified formula to resist reaction with most household chemicals thus protecting the floor and furniture from abrasion, scuffing, and other damages. This poly brings out the best from wood in terms of beauty and durability, unlike other conventional waterborne polys. Furthermore, it meets all the industry environmental standards as it has notably low emission of solvent vapor. Aqua Zar polyurethane is recommended for use on the interior surfaces only. It is, however, child safe when dry. This poly is desirable for use on exotic wood species such as Teak, Brazilian walnut and plenty more. It is made with full compliance with the volatile organic compounds rules and regulations. After application, it is advisable to refrain from touching the equipment for two hours to avoid leaving unpleasant marks on the furniture. If you intend to add two more coats over the first one, you should wait a minimum of two hours for each coat to dry up completely. Floors should be ready for light use a day after application, moderate use after 3-5 days and a maximum use a week after application. If you had an experience of unpleasant yellowing after applying a poly, Aqua Zar is the poly to try out now. This product is packed in a quart. One quart of Aqua Zar covers an area of up to 125 sq ft. It should be applied in properly ventilated moves while utilizing gas masks to prevent oneself from the harmful vapors emitted from the solvent used. This polyurethane is highly regarded for use on the interior and the exterior surfaces as well. It is available in gloss finish. It is a water-based poly modified with urethane to provide added protection against sun rays, water, and wind damage. This poly is made from an advanced formula and contains Ultra-violet absorber and inhibitors to offer excellent protection against the damaging effects of sun and water. It is an ideal poly for stained as well as bare wood surfaces such as a door, interior and exterior floors, furniture, cabinets, and plenty more. Deft interior/ exterior polyurethane has proven greater durability than oil-based polyurethanes. It is carefully formulated to meet the volatile organic compounds and environmental regulations for low odor emissions. It is made of 100% urethane formulated with advanced waterborne oil modified polyurethane technology to produce a clear protective coating. For exterior surfaces, it provides excellent weather-resistance and enhances durability. This is the poly that takes wood finishing to a higher level. It spreads quickly and dries smoothly with significantly low odor. The coating after drying up does not impart the wood color. It is highly recommended on floors where wood protection is paramount as it offers unparalleled protection. 1-quart container of this gloss finish can cover an area of up to 125 sq ft. Using a polyurethane applicator is recommended to get great and fast coverage. It does not produce a yellowing effect after drying up, and it’s non-toxic when it dries up. The coat dries within two hours after application, and it is ready for recoat to produce excellent results. After drying up, the coat is crystal clear, performs exactly as intended, and is easy to clean up using water. Polyurethanes are the coatings used to protect your floor from damage. Conventionally, three layers of this kind of finish are needed to ensure the longevity of the coating and protection of the floor. The type and brand you use for coating your floor are of crucial importance. It determines how long the coating will last. Finally, the choice on whether to choose listed brands depends on your budget, the type of wood used on your floor, as well as the look of the color choice you want. The decision on whether to use water-based or oil-based polyurethane depends on the result you want to obtain from the finishing. The water-based polyurethane is preferred to provide clear results when reducing the drying duration and lower odor while applying the poly. In the past, oil-based polyurethanes were more common compared to water-based polys. However, the situation has changed recently. Contrary to the perception of many people, water-based polyurethanes are super durable too and at times more durable than the oil-based ones. This is due to the fact that producers and research centers keep on testing and improving the formula of making these finishes and particularly water-based. As a result, improved water-based polyurethanes have been developed with great added advantages which should make you consider using them for your floor. To highlight a few quick tips, the best water-based polyurethanes should cost less than the oil-based but still as durable, should cure easily, smell less, and look the best. The following are the factors to consider while buying the water-based polyurethane. If the smell is a significant concern, especially for people with breathing problems, you should consider a brand that fully complies with VOC and environmental standards. Also, you should consider proper ventilation while applying the polys. Water-borne polyurethane is highly regarded as the dry fast and allow you to use your furniture within a few days after application. For high traffic floors and heavily used furniture, polys with ultra-fast drying speed should be considered. When on a low budget, Bona Mega Polyurethane should be considered as it is highly effective and comes at a low price. However, the product has excellent results. For a table top, as well as other exterior coatings polyurethanes with a no-yellowing effect, should be applied. 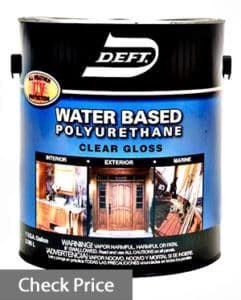 Polyurethanes formulated with an advanced formula such as the Deft interior/exterior poly should be used as they have enhanced components to prevent the wood from damage including the weather-related damages. This is a crucial factor to consider regarding the surface you want to finish. For surfaces that require regular cleaning polys with ease of cleaning should be applied. Water-based polyurethanes are as effective and durable as oil borne polys. They, however, provide a lighter and a clearer color impact on wood as opposed to the yellow coloring effect by the oil-based polys. Also, they dry faster and cures faster. Water-based polyurethanes smells less and dissipates faster while complying with environmental and volatile organic compound regulations. They are better for maple natural, white spots, and gray finishes.